CRESPINE®GEL is a resorbable, intraarticular implant of high purity. 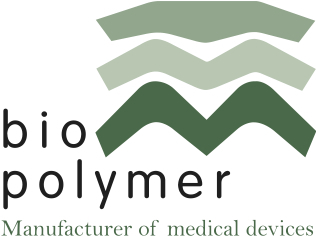 It is a medical device, produced of non-animal based hyaluronic acid. Osteoarthrosis of the hip joint. 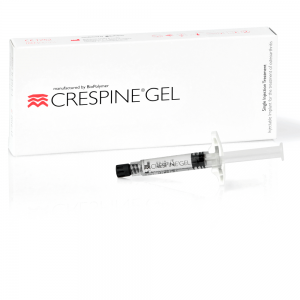 CRESPINE®GEL is injected intra-articular as an addition to the changed synovial fluid for reduction of pain and a improvement of the joint function. CRESPINE®GEL is a one-single treatment product, which means, only one treatment is necessary for optimal results. 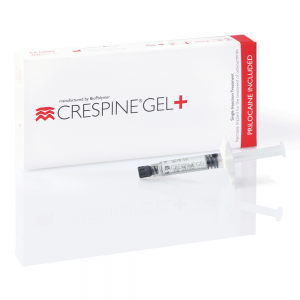 CRESPINE®GEL is indicated for the correction of joints with degenerated cartilage surface and pathological changed synovial fluid. After the injection the patient experiences a improvement in the sense of pain, which will result in a higher quality of life..
CRESPINE®GEL is injected with a sterile needle. The implantation takes place in the joint space. The injection technique is of crucial importance for the final results. CRESPINE®GEL must only be used by authorized medical staff in conformity with the regional laws and by-laws. The simultaneous treatment of several joints is not possible.